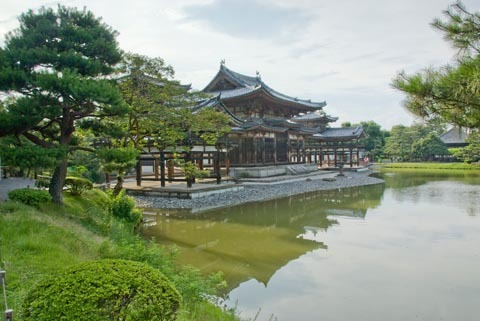 The next stop on our trip was to Uji. We went to watch a traditional cormorant fishing demonstration. 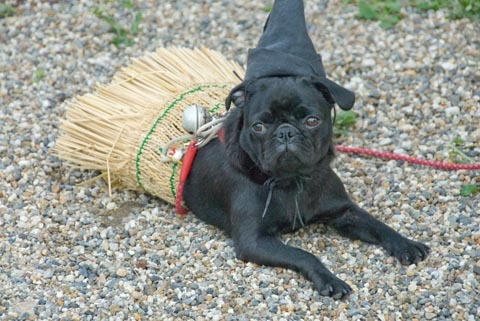 The fisherwomen wear this same type of costume: a black cap and grass skirt. I couldn’t resist getting a shot of this adorable guy by the ticket sales booth though. First we visited Byodoin, the temple on the 10 yen coin. It’s beautiful. The old fading paint seems proper and historical, but surely it won’t last long–it stands in sharp contrast to the fresh bright orange paint on the bridge. 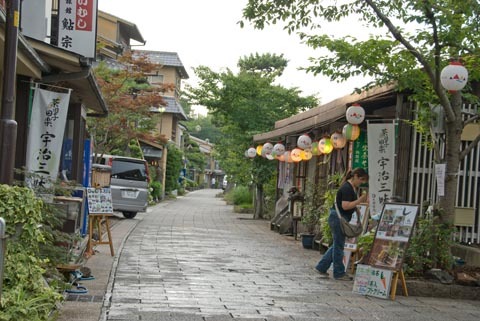 Uji is a famous tea growing area, so many of the shops along the traditional streets near the temple invite customers with matcha soft-serve ice cream and matcha parfaits. 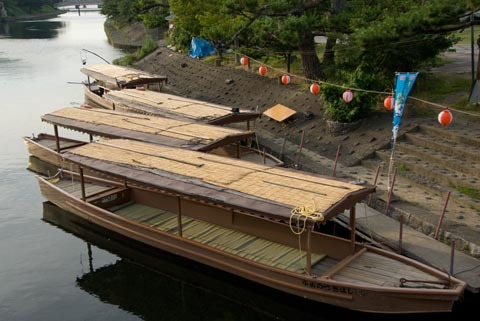 We walked along the river in the afternoon, and as evening descended we boarded one of these boats. 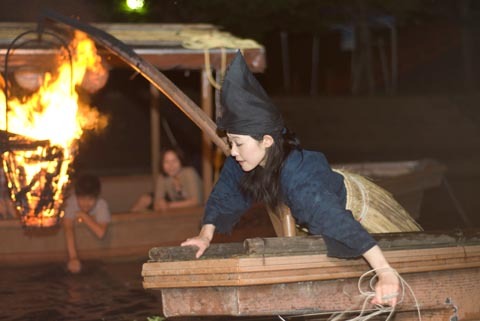 After a brief explanation (in Japanese) about the history of cormorant fishing, the demonstration began. The birds have a ring around their necks, so they can swallow only the smallest fish, while the rest are for the fisherwoman. Of course the birds get to eat plenty of fish after the show’s over. To begin, the logs in the basket are lit aflame. The fish are drawn to the surface, thinking the light is from the moon. The fisherwoman sings out in an unearthly voice. The boatman raps on the side of the boat with his oar. The chanting and wooden thuds weave an eerie tune. The fisherwoman feeds slack line to the birds as they chase after the fish, flipping over and diving under the water, and just as suddenly bobbing back to the surface. She sees a bird lift its head, trying to swallow the fish. She skillfully tugs him to the boat and scoops him out of the water while letting the rest of the fish continue their hunt. She coaxes the fish out of his mouth, and it falls to the boats floor. Then she tosses the bird back to the water where he rushes back to hunt again. Finally, the birds are fed, the boats are empty, and the water is still, except for lone fishermen working their rods from the shore. 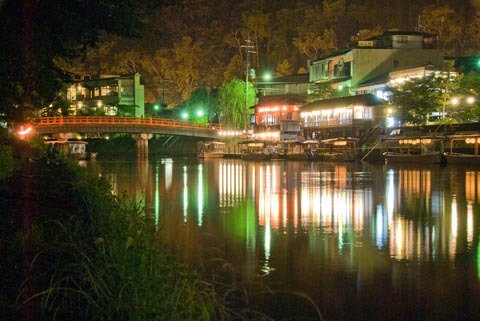 A peaceful night in Uji, and now we’re hoping to be fed too.